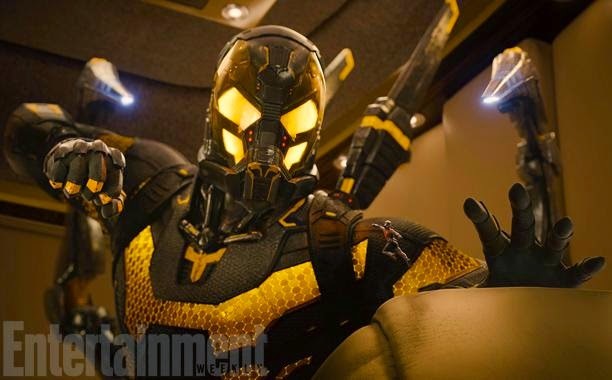 It's been all quiet on the Ant-Man front lately (might have something to do with Avengers: Age of Ultron opening in under two weeks), but Entertainment Weekly change all that with our first look at Corey Stoll's villainous Darren Cross in his next generation, weaponised Ant-Man suit, dubbed Yellowjacket (with a tiny Ant-Man readying a punch in the lower right corner). No doubt, a new Ant-Man will be coming it's way soon, to tie into the Earth's Mightiest Heroes latest adventure, and hopefully it builds on the action promised in this latest still. The first trailer was a bit too sombre when you consider the fun the concept of a shrinking super hero promises, so any future trailer should remedy that.